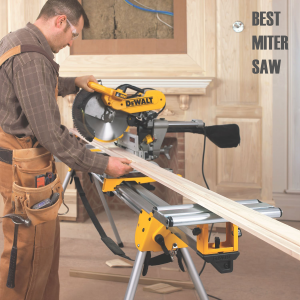 Are you looking for the best miter saw? The best miter saws are an indispensable piece of equipment in any workshop as you need it to make miter and bevel cuts to crosscuts and compound cuts. No matter if you are professional with a heavy workload to take care of, or an ardent do-it-yourself attempting a home improvement job, miter saws come in various options for you to choose from. The fact that this tool is safe to use and lets you perform specific tasks like making sharp angled cuts through various materials. As a result, this is what makes it an important piece of equipment in any workshop. So if you need the best miter saw to buy for yourself, you have come to the right place. 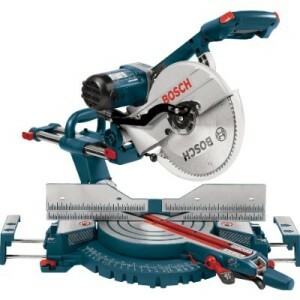 You here have honest and complete reviews of the best-selling and top-rated miter saws in the market. You also have a guide and tips that help you choose the best miter saw for your needs. You should remember that miter saws let you complete specific operations both efficiently and safely. These tools come with a blade guard which exposes the blade as much as required to get specific jobs done as safely as possible. Moreover, this saw has its switches positioned away from the blade and comes with an electric brake to ensure the blade quickly stops in emergencies. The miter is one form of circular power saw which is generally mounted over a frame and is used for making accurate angle cuts. The motor, as well as the blade, are mounted upon hinged arm that is attached to rear of the saw. The blade is lowered for cutting the workpiece and passes within a slot present in the base. There are so many miter saws in the market, with their pros and cons. Choosing the best miter saw to add to your bevy of tools and equipment can thus prove to be difficult without the help of some external help. So to help you in this direction, here is a listing of the present top 5 best miter saws in the market. No matter how safe this tool is, there is no miter saw that exists without any errors. This is why these miter saws reviews have been compiled to give you a list of the negatives and positives of various miter saws. This list however comprises of the best miter saws that have average ratings and individual scores with pros outweighing the cons. 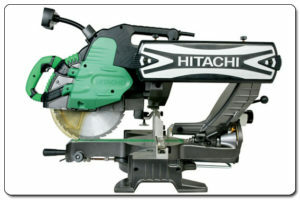 The first in line of the top 5 best miter saws is the C10FCE2 model Hitachi miter saw. This 10 inch miter saw offers the smoothest and most accurate of crosscuts and miters used in various work pieces like soft fibreboard, hard board, plywood, wood, decorative panels and aluminium sashes. The saw boasts of producing miter angles that are flexible in addition to compound cutting capacities that give you the versatility required in any job for carpenters, woodworkers and framers who need demand and reliability in their work. Till date, this miter saw is considered to be a very light and practically the most portable in the market today. This thumb-actuated positive miter saw helps make accurate miter adjustments ranging between 0 and 52 degrees wherein you can find it easy to change the cutting blade’s angle whenever you use the saw to create miters for all your crown moulding requirements. Its optimum bevel range helps provide gorgeous bevels at the first attempt. Its additional blade which is 10″ long and made of tungsten carbide helps you create delicate trims and other woodwork so easily. In addition, while its large, extended flip fences which can be raised to a height of 4″ to provide for the precise measurements and cutting of huge work pieces. The saw has a 15-amp motor that can provide a maximum speed of 5,000 RPM to easily make crosscuts and miters while its horizontal handle is comfortable enough to help reduce the vibrations created through its elastometer grips, which also helps you maintain control on the tool whenever you use it. 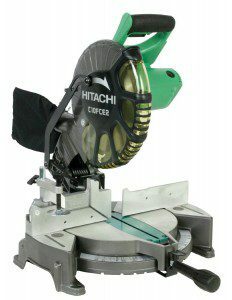 This miter saw from Hitachi also comes with a dust collector to help collect dust and in the process, minimizes the amount of dust and particles that get collected in both your work shop and in the interiors of the saw so that not only is your workplace clean, your tool’s life is also prolonged. At 26.3 pounds, this is probably the tiniest saw in this category, and in turn the most convenient saw in the market to carry along with you wherever required. 1. This miter saw comes with a carbide blade and a large pivoting fence. 2. To ensure easy miters and cross cuts, the miter saw offers a wide miter range and various bevel angles which all help you make precision cuts with the machine. 3. The C10FCE2 boasts of a maximum running speed of 5,000 RPM that is powered by a 15-amp motor. 4. In a nutshell, its weight, portability and accuracy of the miters and crosscuts has made this saw one of the number one options in the market. This saw has blades that lock for safety when not in use. Moreover, the saw is fairly quiet when in use. There is no major disadvantage associated with the saw; some customers just complain that its dust bag cannot collect much dust, which is not much of a drawback. The DEWALT 12-inch single-bevel Miter Saw has a powerful 15 amp motor and convenient features that provide quick and accurate jobs while cutting baseboards and crown moulding. The saw also has a durable carbide blade, a blade wrench and a convenient dust bag to handle various applications. The miter saw system features 11 positive stops that facilitate an easy setup and improved productivity while its easily adjustable cam-lock delivers quick and accurate miter angles. It weighs only 42 pounds and has a built-in carry handle for easy portability. 1. 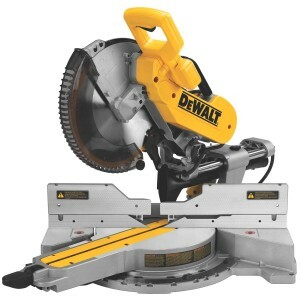 The DW715 DEWALT miter saw has a powerful 15 amp motor that provides a high speed of 4000 rpm. 2. It has a miter plate that is made of stainless steel and is adjustable enough to provide for 11 positive stops and 4 hardened steel bewel stops for its versatility. 3. The miter saw’s tall and sliding fence comes with a crown and base mouldings. These are no specific disadvantages associated with this miter saw except for the fact that it is rather loud and its brakes may not work well with some re-sharpened heavy blades some consumers use. However this fact does not hamper the saw’s chopping abilities. The DEWALT DWS780 miter saw offers the accuracy, portability and capacity to meet both delicate and heavy duty woodworking requirements of installers, carpenters, cabinetmakers and contractors. The saw has an improved ultra-bright LED light that casts a laser-like shadow on the workplace so that the user knows where the blade comes in contact with the material. The saw’s plates are made of stainless steel and are tough enough to withstand the rigors of any job site. Not only is the saw easy to use, it has a cam lock miter button that lets you lock angles between detents while its miter detent override provides for the precise angle adjustment without any detents. 1. The DEWALT DWS780 miter saw has an advanced dust collection system that captures 75% of the generated dust. 2. The saw runs on a 15-amp motor which delivers 3,800 RPM and its power cord is routed through the rail so that there is no interference with the slide. 3. The saw weight only 56 pounds, making it convenient to carry around. The miter saw has no associated disadvantages accept for some consumes who find its slide unacceptable as they consider it sticky, rough and noisy. Some consider it takes additional pressure to slide the blade through. However these are minor disadvantages compared to the other great features and specifications of the miter saw. This Hitachi saw has angles that can be adjusted easily. is equipped for compound cutting It delivers a high level of precision, reliability, and precision. Additionally, it is equipped with a horizontal handle to increase comfort and reduce strain on the user’s hand. an elastomar grip designed to reduce vibration, thus firmening the user’s grip. It has a clamping allowance to hold the piece the user is working on firmly. miter adjustments of between 0 and 52 degrees. To increase the level of accuracy, it also packs a largely extended flip which can raise to 4 inches. It also has a dust collector which It is very light, weighing just 26.3 pounds. It also has an extended warranty of 5 years. The Bosch saw is perfect for cutting wood and similar materials at a wide range of bevel and miter angles. The motor is a powerful 15-amp and can generate up to 3 800 RPM. It has an electric brake designed to stop the blade fast. It has a range-selecting knob at the front, and also packs a bevel lock lever, making it fast and safe. The scales are easy to read, ensuring a high level of accuracy. Another interesting feature is the exclusive miter detent system which locks the blade securely for consistent cutting. The base is 25.5 inches but can extend to 40 inches, making this saw capable of handling different tasks. The blade is durable, with a 60-tooth blade. In addition, the manufacturer offers a one-year warranty. 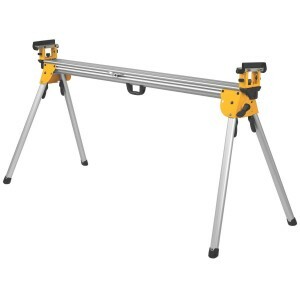 The DEWALT’s DWX723 miter saw stand helps expand the usage of any branded miter saw. it universal design makes it compatible with most miter saw brands and is thus helpful to construction workers, contractors, carpenters and even home miter saw users. It has a maximum capacity of 500 pounds while its 51/2 foot main beam can stretch to support 16 feet’s worth of materials. It also has an extended length of about 50 inches with extension lock levers which help lock the supporting extensions while providing some impact resistance. At only 35 pounds, it is a rather portable miter saw stand. The stand is easy to store with its folding legs while its mounting brackets work with any miter saw brand. These brackets have a quick release feature and make it possible to use two saws at the stand together. Moreover as the tool mount feet are non-marring, it prevents materials from getting damaged. 1. The DEWALT’s DWX723 miter saw stand is 35 pounds in weight but can withstand 500 pounds of material. Its universal design makes it compatible with all miter saws and its leg lock levers provide for a rapid and easy stand set-up. 2. The stand’s non-marring feet do not scratch material while its 5-1/2 inch beam can support a maximum of 16-feet of material and a maximum of 500 pounds. 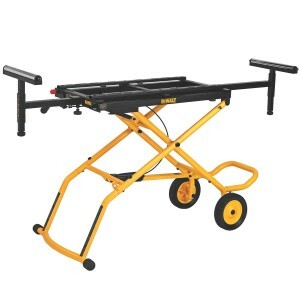 The DEWALT DWX726 rolling miter saw stand comes with a fold-up design and wide rubber wheels for easy jobsite mobility. It is designed for use by various contractors including installers, framers, cabinetmakers, trim carpenters and other professionals using miter saws. It’s three-position pneumatically assisted raising and lowering makes the stand easy to assemble, thus minimizing downtime. The DWX726’s tubular steel construction makes it durable enough to withstand 300 pounds of maximum weight capacity. It’s easily adjustable mounting rails help it adapt to any miter saw of portable thickness planer. The stand weighs only 67 pounds and when folded, measures only 59.5 inches by 17 inches to help save storage space. 1. The DWX726 has three positions for easy raising and lowering of the stand to minimize downtime. 2. It is durable enough to withstand a maximum weight of 300 pounds while its mounting rails can be adjusted to adapt to use with any miter saw. 3. The miter saw stand can be folded to save space while in storage. 4. Its wide rubber grip wheels increases the portability of the miter saw stand. There are not many disadvantages associated with the DEWALT miter saw stand, just that some consumers consider it to be not ergonomic for use by tall people. Of course, this is not a major disadvantage, which only a small percentage of the users may contemplate. While miter saw reviews present the specifications of certain saw models, this guide helps explain the important aspects you need to consider to help you choose the best miter saw. You need to check the blade diameter and the miter saw’s ability to slide to determine its cutting capacity. The standard sizes of blades used in these saws are 10 and 12 inch blades. While the 12-inch blade has a greater capacity than a 10-inch blade, you should decide whether you actually need a 12-inch blade or not. The reason is because saws with 10-inch blades may be a better choice for use in projects where you need to cut through materials up to 2” x 6” or 4” x 4”. Saws with adjustable handles are a better choices if you want maximum control and comfort with your cutting tasks. There are today many types of saw stands available in the market to maximize the use of your miter saw. These stands come in various models. Some of them have wheels to provide for enhanced portability. Ohters are folding stands which can be folded and stored when not in use. And there are also some other stands which have extensions to help support long pieces of materials. Miter saws with easy-to-read indexes help make it easy for you to make adjustments without stopping the saw. So if your woodworking project requires many fast and accurate cuts, it is highly recommended to buy a saw with indexes that are visible when in use. If you tend to perform woodwork tasks where you have to frequently change blades, it is better to buy a miter saw with an easy-to-change blade system. Blade swapping is so much easier with these systems wherein your downtime is minimized. Miter saws with laser guides help ensure that the blade is perfectly lined with your intended cut line. Single laser saws show users where the cut starts while saws with dual lasers show the entire width of the cut. Miter saws with electric brakes improve the safety of the saw and help you get ready for the next cut by stopping the blade just seconds after releasing the trigger. Miter saws with dust ports connect a dust bag or wet/dry vac to the saw to easily collect sawdust and thus give a clean and clear workplace. Positive Stops: These are default set points which let the user execute precise cuts at specific angles. Depth Stops: Many of the miter saws have a feature using which blade height can be adjusted and helps to control the depth of the cut. Blade Guards: The guard remains clear from the stock so that user get a clear view of cutting line and the saw is raised; the guard automatically lowers and fully covers the blade. Electric Brakes: These brakes reverse electricity flow within the motor and stop the blade within a couple of seconds. Shaft Locks: These fully immobilize the blade as well as shaft, thereby helping to make changing blades a lot easier. Dust Blowers: These assist in moving the sawdust away from cutting area. Laser Guides: The laser projects a beam over the work piece and helps to get an accurate cut. Standard Miter Saw: This type of saw usually pivots from one point and the blade cuts square to table. Such saw is utilized for cutting across width of any board by moving the table to right or left. Compound Miter Saw: It is similar to standard saw but here the motor, as well as the blade, can flip over to one side letting the user cut a bevel. It is also possible to cut a bevel and a miter together and can be used to join crown molding or frame roofs. 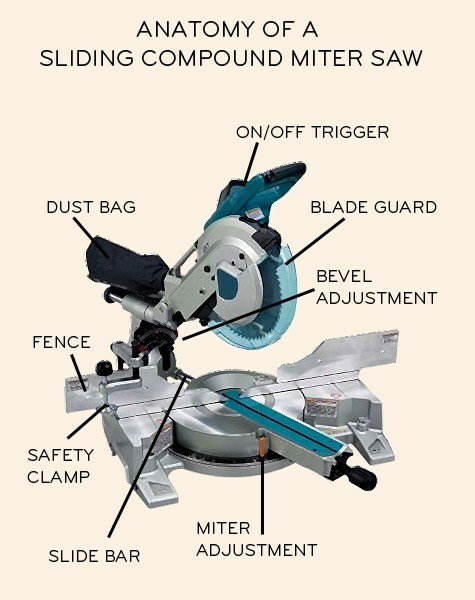 Sliding Compound Miter Saw: This is capable of cutting bevels, miter and compound miters with motor as well as blade sliding forward and back. Dual Compound Miter Saw: It works similar to a sliding compound miter saw but the motor and blade slide to left and right helping to cut bevels as well as compound miters in both directions. 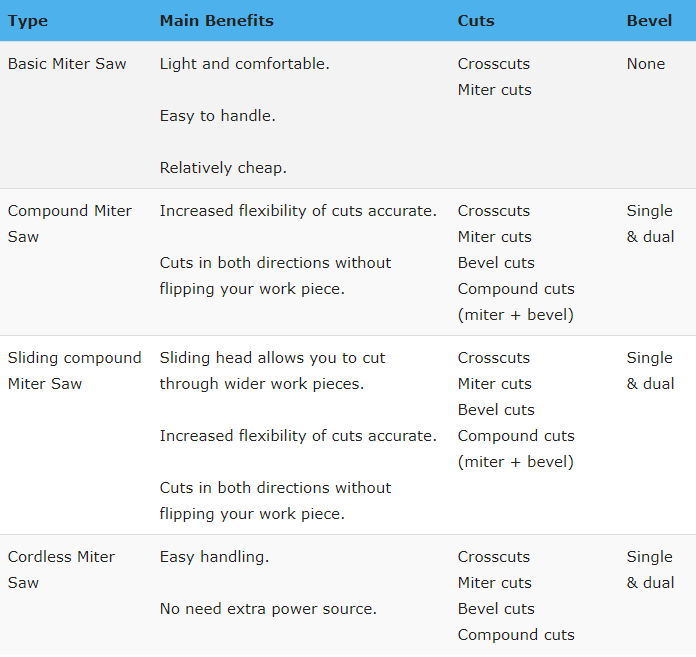 Types of cuts typically performed by a miter saw. Cross Cut – Perpendicular to the grain of wood. Miter Cut – Angled cut on face of wood. Rip Cut – Parallel to the grain of wood. 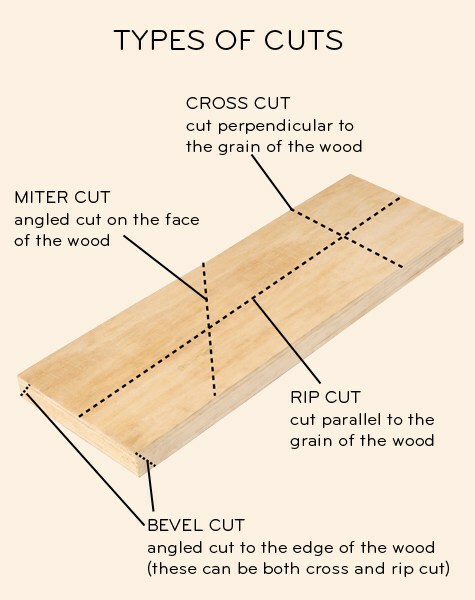 Bevel Cut – Angled cut to the edge of wood. For miter saws, the blade size is an important factor and some of the common sizes consist of blades of 8, 10 or 12 inches. It is also worth mentioning here that larger diameter for blades would mean possibility of longer cuts. Steel Blades: Ideal for use on softwood and are relatively cheaper option to choose. High-speed Steel Blades: These are a lot harder in comparison to steel blades and remain sharp for the longer duration. Carbide Tipped Blades: Such blades are more expensive than other types of blades but are useful for cutting hardwood and stay sharp for more time. Unplug miter saw while the blade is changed or it is not being used. Keep the fingers about six inches away from blade. Always wear hearing protection and safety glasses while saw is operated. At the time blade spins, do not try to reach under it. Allow the blade to fully stop after cutting completes before you lift it. These miter saws reviews are quite a mouthful, but definitely , ust-read materials to read if you look for the best miter saw to buy for yourself. Of the lot, compound miter saw from Hitachi C10FCE2 model is the best saw for anyone interested or associated with woodworking. It is its many features that put it ahead of the other prominent miter saws. The features of this miter saw worth mentioning are its pivoting fence, its light weight that provides for optimum portability while using the saw and the sharp crosscuts and miters it produces. Moreover, this miter saw has blades that can be locked for safety purposes when not in use. The saw does not produce much noise when in use, so there is no worry about disturbing others while using it. This is what makes this one of the best miter saws in the market today!